It’s February. The trees are bare, the air is chilled, and the days are short. It’s that time of year when creativity bursts forth from constraints. Right now, it’s easy to scour the kitchen for something to cook and conclude that there’s not a whole lot. But I urge you to look closer. You probably have onions. As this is my debut food story (Hi there, nice to “meet” you! ), I’ll open with a memory of a meal that says a lot about my philosophy of food. It was a cool, grey day several years ago. I went to my partner’s home after work so we could have dinner together. When I arrived, I found that the contents of the cupboards were scarce. We were too hungry to walk to the grocery store and too money-conscious to order takeout. So, I pulled all of the potential ingredients out onto the counter. There was flour, yeast, a head of garlic, and an onion. I reached back into the dark corners of the cupboard and produced two sprouting potatoes. In the fridge, I found two eggs and a hard cheese. I stared at these ingredients for a few quiet moments, scanning through a list of possible meals in my head until I landed on a suitable idea: pizza. Then, I got to work. I quickly kneaded flour, yeast, and water into a dough so it had time to rise. I turned the oven on high and stuck in a cookie sheet with a whole head of garlic, partially peeled with the top cut off. I roughly cut slices of onion and threw them in a pan over medium heat to caramelize. Meanwhile, I picked the sprouts off the potatoes, scrubbed them, and sliced them paper thin. Once the garlic was soft, I removed it from the oven, squeezed the cloves out of their skins, and mashed them with a fork. Combined with the caramelized onions, this would be the sauce. After stretching the dough into a good-enough shape, I spread onto it the onion and garlic mixture. I always forget what’s supposed to go on the dough after the sauce… Is it the cheese or the toppings? Regardless, I put down the slices of potato in concentric circles first. Then came the cheese, and finally, I poured the two eggs, lightly beaten, on top. I sprinkled on some rosemary, salt, and pepper, and popped it into the already-hot oven. I probably did a little dance or took a short rest, and then, dinner was served. This is my hope for home cooking. No fancy recipes, no special trips to the grocery store, no expectations that it needs to be picture-perfect. You work with what you have—embodied knowledge, time, and available ingredients. It’s functional, it’s humble, and it’s real. In honor of the spirit of home-cooking, I’ve chosen to write about the onion for this first Heirloom Food Story. It’s a vegetable that often goes unnoticed, but it’s truly a workhorse for flavor in food cultures around the globe. It’s easy to overlook onions. Maybe it’s their color. Maybe it’s that they typically play a background role in dishes. Maybe it’s because we humans have gotten so used to their constant presence that we take them for granted. Seeds spread around the world from 2500 B.C. through the end of the eighteenth century, when with the introduction of onions to Australia, they became a global staple. Over our long relationship with onions, they have meant many different things. There have been periods and cultures in which the onion was considered a food for the poorest of poor, as their strong odor offended the wealthy. And then there have been periods and cultures in which the onion was considered sacred, being grown in the gardens of kings. 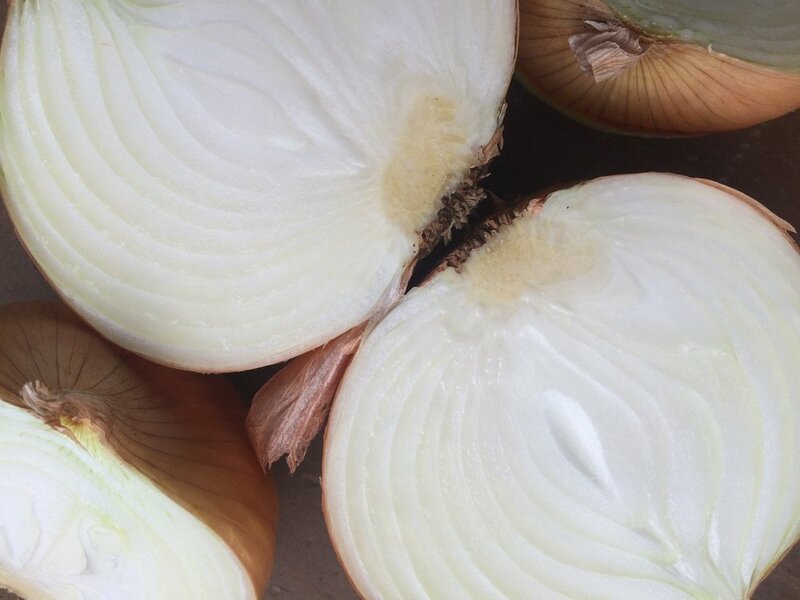 Ancient Egyptians regarded onions as divine and sculpted them from gold. They also were an essential part of the diet of slaves who built the Great Pyramid at Giza, according to Rogers. Many cultures, including the Romans and the Greeks, associated onions with courage and made sure their armies ate loads of them. When Columbus made his second voyage to the New World, this time bringing seventeen ships and twelve hundred men, they carried with them “literally, the seeds of colonization…to start plantations, orchards, and kitchen gardens” writes Raymond Sokolov in Why We Eat What We Eat. Later, the Pilgrims on the Mayflower planted onions as soon as they had cleared the land in what would become the United States. “Legend has it that the name Chicago is a derivation of a Native American word meaning rotting or smelly onions,” writes Rosemary Moon in her book Onions, Onions, Onions. In my own ancestry, my great-grandmother, a peasant farmer in southern Italy, was given a loaf of bread and an onion to last her through each day. The discovery that sticks with me the most is that the word “onion” comes from the Latin for “one,” “oneness,” and “unity.” Union. Onion. I suppose that makes a lot of sense. But, like many things when it comes to the onion, I had never taken the time to ponder it. Have you ever looked at an onion? Really, really looked at one? It seems like one of those things that can be there for so long, supporting us and playing an integral role, but we’ve never taken the time to truly see it and appreciate it. When you look at those perfectly circular rings and notice the way they wrap around each other to form one whole sphere, there’s no wondering how the onion got its name. Did you know that some onions are sweeter than apples? According to Rogers, the Vidalia onion has a 12.5 percent natural sugar content, compared to an apple which has 11 percent. If this comes as a surprise to you like it did to me, consider how the raw onion presents itself to us with a harsh bite, one that was designed to repel animals (or parents, as it did mine when I used to eat green onions straight from the ground and then lean in close to whisper a breathy message to them). How are we supposed to know onions are full of sugar? Harold McGee explains in On Food and Cooking that onions store their energy in chains of fructose sugars—not starch—and cooking the onions slowly for a long time breaks down these structures, revealing sweetness in a most unexpected place. In coaxing out the sweetness, we practice our patience—we learn what it feels like to allow something to develop over time. We begin to understand that some things simply cannot be immediately understood or rushed. Because food is a lens I use to make sense of the world, I layer this metaphor onto life in general. Perhaps it means that we take the time to build a stronger relationship with someone who initially repels us, start learning about an issue that we didn’t notice before, or steadily coax out long term change. These processes all require a big dose of unglamorous humility and patience. We are taking an existing structure, breaking it down, and building something new—something sweet—in its place. All the while, I challenge you to take this ubiquitous vegetable and pay it attention. Admire the sound of its skin as it crinkles. Hold it up to the light and notice its translucent sheen. Cut into it, and look at the layers for what they are: symbols of growth and wholeness. Admire the beauty of nature’s order in the circular rings. Beyond the kitchen, I challenge you to contemplate what else you could take the time to develop. Maybe it’s a difficult relationship, an uncomfortable issue, or a widespread change. Break it down. Rearrange the structure. Find the sweetness.